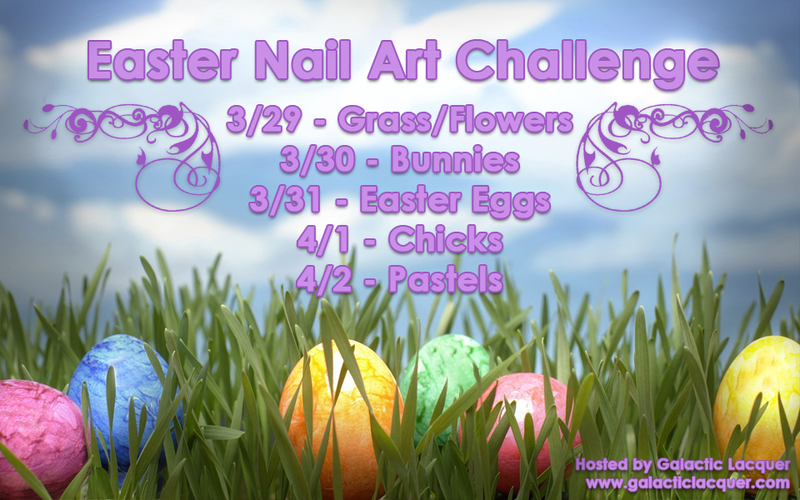 Since I did bunny nail art for spring, I thought I also had to do little chicks! I always think of baby rabbits and chickens for Easter. Plus they're cute, so why not try some nail art of them? Of course I was clumsy at hit one of my nails into the chick with the egg shells. So now he has a scar on his beak! But I love him all the same. As for the others, I really had no idea how to paint baby chicks! I didn't give them any wings or textured fuzz, but I painted little eyes, beaks, and feet to try and portray them in a very simplistic way. I started by painting all of my nails yellow with Julep Blake. I then took my white striping polish and free handed the eggshell pieces on the accent nail. I chose my middle finger to be the accent this time since it's my widest nail after my thumb. I then dotted the eyes with black, and added a tiny bit of glare with smaller white dots. After deciding where their eyes went, I painted the beaks and feet with an orange striping polish. And that's it! I know they're super simple, but I think they're adorable. The chicks almost remind me of Chocobos from Final Fantasy too. I think I'm loving the one on my pinkie nail the most!